Top: The gene is essentially turned off. There is no lactose to inhibit the repressor, so the repressor binds to the operator, which obstructs the RNA polymerase from binding to the promoter and making lactase. Bottom: The gene is turned on. Lactose is inhibiting the repressor, allowing the RNA polymerase to bind with the promoter and express the genes, which synthesize lactase. Eventually, the lactase will digest all of the lactose, until there is none to bind to the repressor. The repressor will then bind to the operator, stopping the manufacture of lactase. In genetics, a promoter is a region of DNA that initiates transcription of a particular gene. 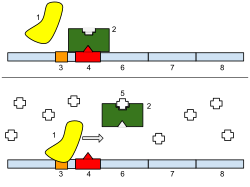 Promoters are located near the transcription start sites of genes, on the same strand and upstream on the DNA (towards the 3' region of the anti-sense strand). Promoters can be about 100–1000 base pairs long. General transcription factor binding sites, e.g. TATA box, B recognition element. Many other elements/motifs may be present. There is no such thing as a set of "universal elements" found in every core promoter. In bacteria, the promoter contains two short sequence elements approximately 10 (Pribnow Box) and 35 nucleotides upstream from the transcription start site. The above promoter sequences are recognized only by RNA polymerase holoenzyme containing sigma-70. RNA polymerase holoenzymes containing other sigma factors recognize different core promoter sequences. Certain sequence characteristics have been observed in bidirectional promoters, including a lack of TATA boxes, an abundance of CpG islands, and a symmetry around the midpoint of dominant Cs and As on one side and Gs and Ts on the other. A motif with the consensus sequence of TCTCGCGAGA, also called the CGCG element, was recently shown to drive PolII-driven bidirectional transcription in CpG islands. CCAAT boxes are common, as they are in many promoters that lack TATA boxes. In addition, the motifs NRF-1, GABPA, YY1, and ACTACAnnTCCC are represented in bidirectional promoters at significantly higher rates than in unidirectional promoters. The absence of TATA boxes in bidirectional promoters suggests that TATA boxes play a role in determining the directionality of promoters, but counterexamples of bidirectional promoters do possess TATA boxes and unidirectional promoters without them indicates that they cannot be the only factor. Changes in promoter sequences are critical in evolution as indicated by the relatively stable number of genes in many lineages. For instance, most vertebrates have roughly the same number of protein-coding genes (about 20,000) which are often highly conserved in sequence, hence much of evolutionary change must come from changes in gene expression. Given the short sequences of most promoter elements, promoters can rapidly evolve from random sequences. For instance, in E. coli, ~60% of random sequences can evolve expression levels comparable to the wild-type lac promoter with only one mutation, and that ~10% of random sequences can serve as active promoters even without evolution. Most diseases are heterogeneous in cause, meaning that one "disease" is often many different diseases at the molecular level, though symptoms exhibited and response to treatment may be identical. How diseases of different molecular origin respond to treatments is partially addressed in the discipline of pharmacogenomics. Not listed here are the many kinds of cancers involving aberrant transcriptional regulation owing to creation of chimeric genes through pathological chromosomal translocation. Importantly, intervention in the number or structure of promoter-bound proteins is one key to treating a disease without affecting expression of unrelated genes sharing elements with the target gene. Some genes whose change is not desirable are capable of influencing the potential of a cell to become cancerous. ^ Chromatin remodeling: from transcription to cancer.Cancer Genet. 2014 Sep;207(9):352-7. ^ Promoter organization of the interferon-A genes differentially affects virus-induced expression and responsiveness to TBK1 and IKKepsilon. J Biol Chem. 2006 Feb 24;281(8):4856-66. ^ a b c Gagniuc, P; Ionescu-Tirgoviste C (2013). "Gene promoters show chromosome-specificity and reveal chromosome territories in humans". BMC Genomics. 14 (278): 278. doi:10.1186/1471-2164-14-278. PMC 3668249. PMID 23617842. ^ a b Smale, T.; Kadonaga, T. (2003). "The RNA polymerase II core promoter". Annual Review of Biochemistry. 72: 449–479. doi:10.1146/annurev.biochem.72.121801.161520. ISSN 0066-4154. PMID 12651739. ^ Juven-Gershon, T; Kadonaga, JT (15 March 2010). "Regulation of gene expression via the core promoter and the basal transcriptional machinery". Developmental biology. 339 (2): 225–9. doi:10.1016/j.ydbio.2009.08.009. PMC 2830304. PMID 19682982. ^ Ross, W.; Gosink, K. K.; Salomon, J.; Igarashi, K.; Zou, C.; Ishihama, A.; Severinov, K.; Gourse, R. L. (1993). "A third recognition element in bacterial promoters: DNA binding by the alpha subunit of RNA polymerase". Science. 262 (5138): 1407–1413. Bibcode:1993Sci...262.1407R. doi:10.1126/science.8248780. PMID 8248780. ^ Estrem, S. T.; Ross, W.; Gaal, T.; Chen, Z. W.; Niu, W.; Ebright, R. H.; Gourse, R. L. (1999). "Bacterial promoter architecture: Subsite structure of UP elements and interactions with the carboxy-terminal domain of the RNA polymerase alpha subunit". Genes & Development. 13 (16): 2134–2147. doi:10.1101/gad.13.16.2134. PMC 316962. PMID 10465790. ^ a b c Gagniuc, P; Ionescu-Tirgoviste, C (Sep 28, 2012). "Eukaryotic genomes may exhibit up to 10 generic classes of gene promoters" (PDF). BMC Genomics. 13 (1): 512. doi:10.1186/1471-2164-13-512. PMC 3549790. PMID 23020586. Retrieved 7 January 2013. ^ Gershenzon NI, Ioshikhes IP; Ioshikhes (2005). "Synergy of human Pol II core promoter elements revealed by statistical sequence analysis". Bioinformatics. 21 (8): 1295–300. doi:10.1093/bioinformatics/bti172. PMID 15572469. ^ Lagrange T, Kapanidis, Tang, Reinberg, Ebright (1998). "New core promoter element in RNA polymerase II-dependent transcription: sequence-specific DNA binding by transcription factor IIB". Genes & Development. 12 (1): 34–44. doi:10.1101/gad.12.1.34. PMC 316406. PMID 9420329. ^ Levine, M.; Tjian, R. (July 2003). "Transcription regulation and animal diversity". Nature. 424 (6945): 147–151. Bibcode:2003Natur.424..147L. doi:10.1038/nature01763. ISSN 0028-0836. PMID 12853946. ^ Liefke, R; Windhof-Jaidhauser, IM; Gaedcke, J; Salinas-Riester, G; Wu, F; Ghadimi, M; Dango, S (June 2015). "The oxidative demethylase ALKBH3 marks hyperactive gene promoters in human cancer cells". Genome Med. 7 (1): 66. doi:10.1186/s13073-015-0180-0. PMC 4517488. PMID 26221185. ^ a b c d e Trinklein, N. D.; Aldred, S. F.; Hartman, S. J.; Schroeder, D. I.; Otillar, R. P.; Myers, R. M. (2003). "An Abundance of Bidirectional Promoters in the Human Genome". Genome Research. 14 (1): 62–6. doi:10.1101/gr.1982804. PMC 314279. PMID 14707170. ^ Yang, Mary Q.; Koehly, Laura M.; Elnitski, Laura L. (2007). "Comprehensive Annotation of Bidirectional Promoters Identifies Co-Regulation among Breast and Ovarian Cancer Genes". PLoS Computational Biology. 3 (4): e72. Bibcode:2007PLSCB...3...72Y. doi:10.1371/journal.pcbi.0030072. PMC 1853124. PMID 17447839. ^ Adachi, Noritaka; Lieber, Michael R. (2002). "Bidirectional Gene Organization". Cell. 109 (7): 807–9. doi:10.1016/S0092-8674(02)00758-4. PMID 12110178. ^ Koyanagi, Kanako O.; Hagiwara, Masato; Itoh, Takeshi; Gojobori, Takashi; Imanishi, Tadashi (2005). "Comparative genomics of bidirectional gene pairs and its implications for the evolution of a transcriptional regulation system". Gene. 353 (2): 169–76. doi:10.1016/j.gene.2005.04.027. PMID 15944140. ^ Liu, Bingchuan; Chen, Jiajia; Shen, Bairong (2011). "Genome-wide analysis of the transcription factor binding preference of human bi-directional promoters and functional annotation of related gene pairs". BMC Systems Biology. 5: S2. doi:10.1186/1752-0509-5-S1-S2. PMC 3121118. ^ a b Shu, J.; Jelinek, J; Chang, H; Shen, L; Qin, T; Chung, W; Oki, Y; Issa, J. P. (2006). "Silencing of Bidirectional Promoters by DNA Methylation in Tumorigenesis". Cancer Research. 66 (10): 5077–84. doi:10.1158/0008-5472.CAN-05-2629. PMID 16707430. ^ a b Wei, Wu; Pelechano, Vicent; Järvelin, Aino I.; Steinmetz, Lars M. (2011). "Functional consequences of bidirectional promoters". Trends in Genetics. 27 (7): 267–76. doi:10.1016/j.tig.2011.04.002. PMC 3123404. PMID 21601935. ^ Mahpour, Amin; Scruggs, Benjamin S.; Smiraglia, Dominic; Ouchi, Toru; Gelman, Irwin H. (2018-10-17). "A methyl-sensitive element induces bidirectional transcription in TATA-less CpG island-associated promoters". PLOS ONE. 13 (10): e0205608. doi:10.1371/journal.pone.0205608. ISSN 1932-6203. ^ Lin, J. M.; Collins, P. J.; Trinklein, N. D.; Fu, Y.; Xi, H.; Myers, R. M.; Weng, Z. (2007). "Transcription factor binding and modified histones in human bidirectional promoters". Genome Research. 17 (6): 818–27. doi:10.1101/gr.5623407. PMC 1891341. PMID 17568000. ^ Koev, Gennadiy; Miller, W. Allen (2000-07-01). "A Positive-Strand RNA Virus with Three Very Different Subgenomic RNA Promoters". Journal of Virology. 74 (13): 5988–5996. doi:10.1128/jvi.74.13.5988-5996.2000. ISSN 0022-538X. PMC 112095. PMID 10846080. ^ Gagniuc, Paul; Ionescu-Tirgoviste, Constantin (2012-09-28). "Eukaryotic genomes may exhibit up to 10 generic classes of gene promoters". BMC Genomics. 13 (1): 512. doi:10.1186/1471-2164-13-512. ISSN 1471-2164. PMC 3549790. PMID 23020586. ^ Yona, Avihu H.; Alm, Eric J.; Gore, Jeff (2018-04-18). "Random sequences rapidly evolve into de novo promoters". Nature Communications. 9 (1): 1530. Bibcode:2018NatCo...9.1530Y. doi:10.1038/s41467-018-04026-w. ISSN 2041-1723. PMC 5906472. PMID 29670097. ^ a b c Ionescu-Tîrgovişte, Constantin; Gagniuc, Paul Aurelian; Guja, Cristian (2015). "Structural Properties of Gene Promoters Highlight More than Two Phenotypes of Diabetes". PLOS ONE. 10 (9): e0137950. Bibcode:2015PLoSO..1037950I. doi:10.1371/journal.pone.0137950. PMC 4574929. PMID 26379145. ^ DeHaseth, P.L. ; Zupancic, M.; Recor, T.M. (1998). "RNA Polymerase-Promoter Interactions: the Comings and Goings of RNA Polymerase". Journal of Bacteriology. 180 (12): 3019–3025. PMC 107799. PMID 9620948. ^ Singer, P.; Wu, C.W. (1987). "Promoter Search by Escherichia coli RNA Polymerase on a Circular DNA Template". The Journal of Biological Chemistry. 262: 14178–14189. ^ Borukhov, S.; Nudler, E. (2003). "RNA polymerase holoenzyme: structure, function and biological implications". Current Opinion in Microbiology. 6 (2): 93–100. doi:10.1016/s1369-5274(03)00036-5. PMID 12732296. ^ Deaton AM, Bird A (2011). "CpG islands and the regulation of transcription". Genes Dev. 25 (10): 1010–22. doi:10.1101/gad.2037511. PMC 3093116. PMID 21576262. ^ Chen HY, Shao CJ, Chen FR, Kwan AL, Chen ZP (2010). "Role of ERCC1 promoter hypermethylation in drug resistance to cisplatin in human gliomas". Int. J. Cancer. 126 (8): 1944–54. doi:10.1002/ijc.24772. PMID 19626585. ^ a b Bird A (2002). "DNA methylation patterns and epigenetic memory". Genes Dev. 16 (1): 6–21. doi:10.1101/gad.947102. PMID 11782440. ^ Hobbs, K.; Negri, J.; Klinnert, M.; Rosenwasser, L. J.; Borish, L. (1998). "Interleukin-10 and Transforming Growth Factor- β Promoter Polymorphisms in Allergies and Asthma". American Journal of Respiratory and Critical Care Medicine. 158 (6): 1958–1962. doi:10.1164/ajrccm.158.6.9804011. PMID 9847292. ^ Burchard, E. G.; Silverman, E. K.; Rosenwasser, L. J.; Borish, L.; Yandava, C.; Pillari, A.; Weiss, S. T.; Hasday, J.; Lilly, C. M.; Ford, J. G.; Drazen, J. M. (1999). "Association Between a Sequence Variant in the IL-4 Gene Promoter and FEV1in Asthma". American Journal of Respiratory and Critical Care Medicine. 160 (3): 919–922. doi:10.1164/ajrccm.160.3.9812024. PMID 10471619. ^ Kulozik, A. B. K.; Bellan-Koch, A.; Bail, S.; Kohne, E.; Kleihauer, E. (May 1991). "Thalassemia intermedia: moderate reduction of beta globin gene transcriptional activity by a novel mutation of the proximal CACCC promoter element". Blood. 77 (9): 2054–2058. ISSN 0006-4971. PMID 2018842. ^ Petrij, F.; Giles, H.; Dauwerse, G.; Saris, J.; Hennekam, C.; Masuno, M.; Tommerup, N.; Van Ommen, J.; Goodman, H.; Peters, D. J.; Breuning, M. H. (July 1995). "Rubinstein-Taybi syndrome caused by mutations in the transcriptional co-activator CBP". Nature. 376 (6538): 348–351. Bibcode:1995Natur.376..348P. doi:10.1038/376348a0. ISSN 0028-0836. PMID 7630403.